‘Booster’ the dog has give a vital boost to children’s safety in the West Midlands by joining a campaign set up by Fire Service Crew Commander Darran Gough. The campaign aims to remind Year 4 pupils and their parents about the life-saving importance of using car booster seats and seatbelts, and is being run in conjunction with Jaguar Land Rover. Pupils at Templars Primary School in Coventry were invited to come up with a mascot, artwork and slogans for the campaign - at the centre of which is a ‘walk-through’ Range Rover Evoque which will tour schools to help drive home the safety message. Crew Comm Gough said: “The idea’s very simple. We take the car to schools and invite children to walk through a gap in it - at home time, in front of their parents. If they can do it without ducking, they still need to be using a booster seat when they travel in a car. Children under 1.35m tall or younger than 12 are required by law to travel on a booster seat. However, the recommended safety height is 1.5m because all seatbelts are designed to be worn by people who are 5ft-plus tall. Boosters give children the extra height they need to wear a seatbelt and travel safely. The Range Rover Evoque will help to round-off safety sessions at schools, during which WMFS firefighters, often working with West Midlands Ambulance Service, will work with pupils on seatbelt safety. 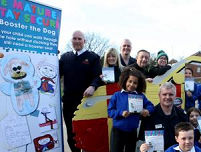 Height charts featuring the winning designs and ‘Booster’ the dog will be left with each school, along with safety leaflets for pupils, parents and teachers. The campaign slogan is ‘Be mature, stay secure’. Helen Riach, Deputy Headteacher of Templars Primary School, said: “It was a real honour to be asked to be involved in the campaign, and to be the launch school for Coventry. “The children were really excited when the initial competition to design the mascot started, and they have all learnt some valuable information about how to keep themselves safe.